"Our 1700 Mile Odyssey (Vacation)"
"go! have more fun, go!, see everything, go!" Lynda "Dianne" Williams-Donley and I, Christine Haven, really started our odyssey 48 years ago when we first met as six year olds at the Vine Street Children's Home. We never could have dreamed that we would still be in touch so many years later and that we would be able to take a wonderful vacation together like this one. But we did and we had a great time. Dianne and I hope that you will find your childhood friends through this website and be able to spend special times with them too. Tom said those magic words, so that's what we did! 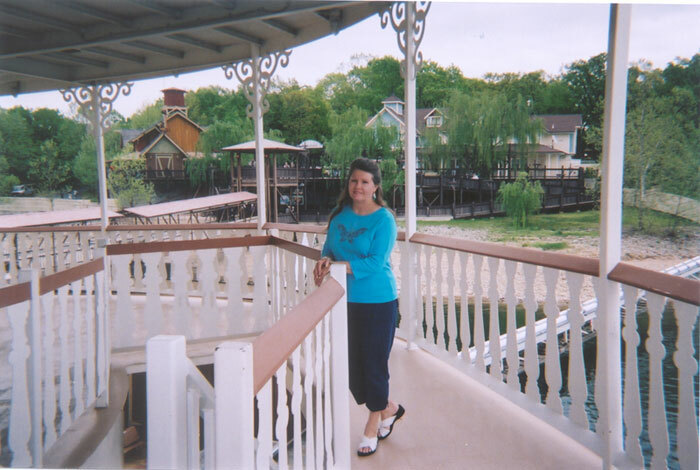 Dianne flew from her home in San Diego, California, to the Houston Airport where I was waiting to load up her luggage, then we headed straight out of town for our first stop, Texarkana, Texas. George Hatch, our Bonny Oaks brother, had recommended a restaurant there plus it was as far as we could drive that first day. We missed the restaurant by 15 minutes, they were closed and the last customer was walking to his car. 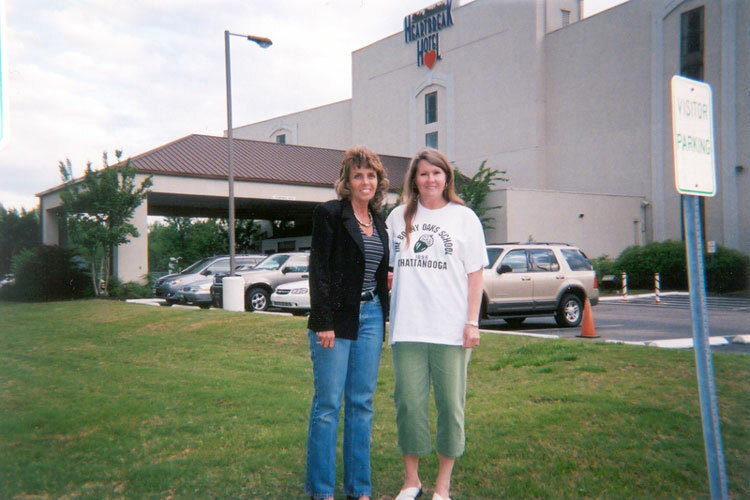 We stayed at the Hampton Inn in Texarkana and was up early the next morning to drive to Little Rock, Arkansas to see George and Connie Hatch. Here are a few pictures from our visit with them. For every picture you see below we had a hundred stories and laughs to go with them. 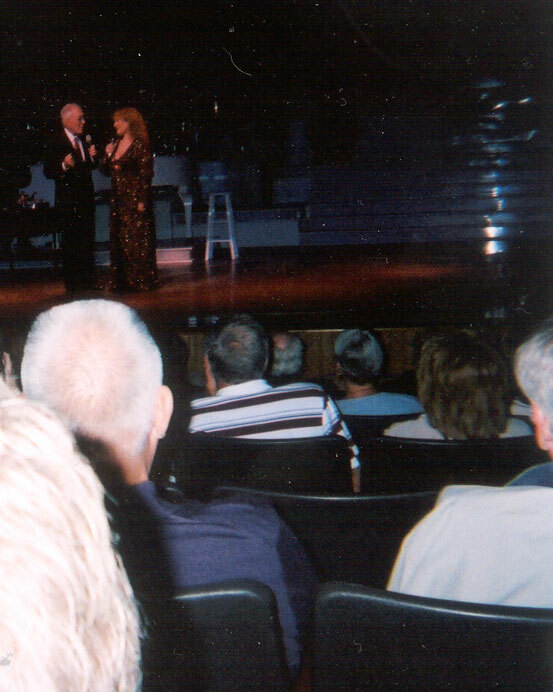 Thank you, George and Connie, we had a great time!!! 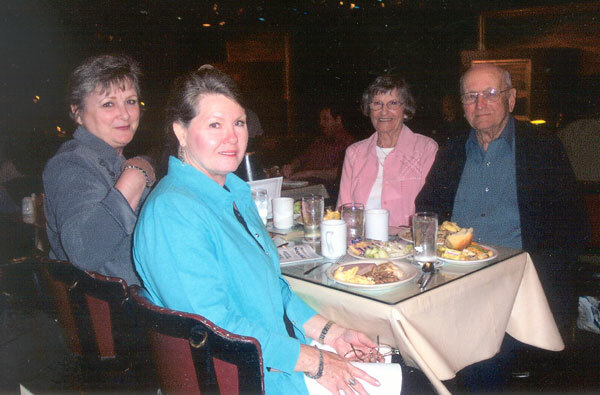 George and Connie made reservations for us at the Murry's Dinner Theatre in Little Rock, Arkansas. We had a great dinner and watched a live play of Annie Get Your Gun! It was a night to remember! 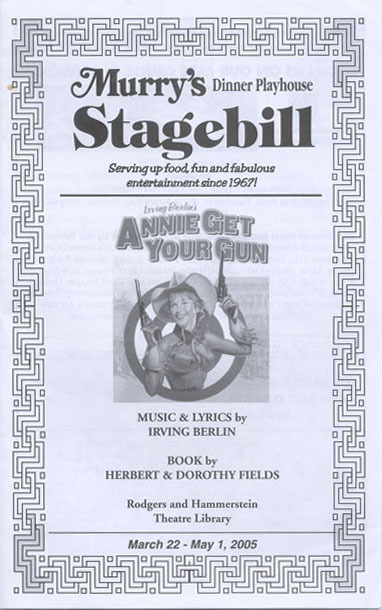 The Stagebill from the Murry's Dinner Playhouse - Annie Get Your Gun - The show was a real treat. 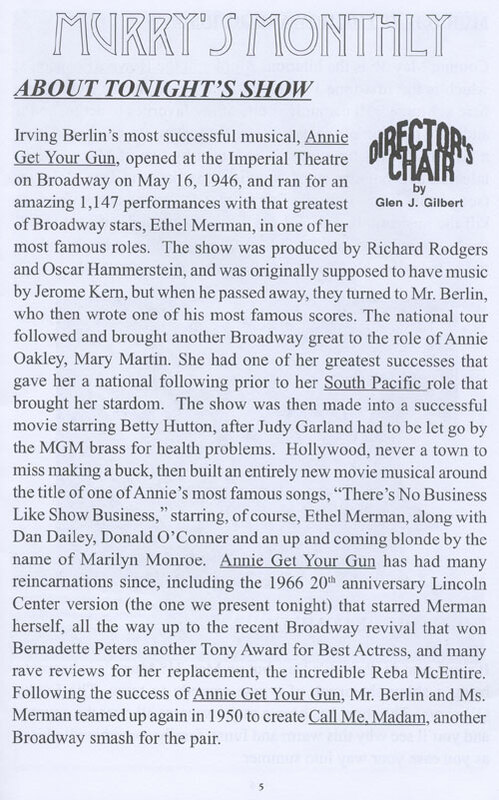 It was my first dinner theatre and I loved every minute, I'm sure Dianne did too! 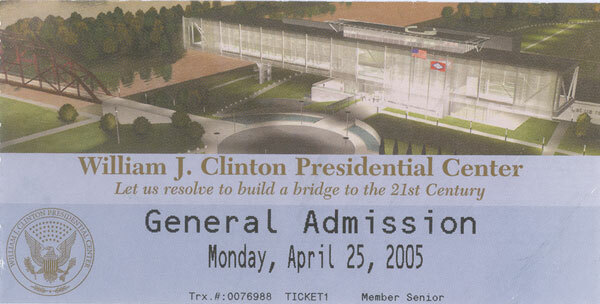 On Monday, April 25, 2005, we went to the Clinton Library in Little Rock, Arkansas. 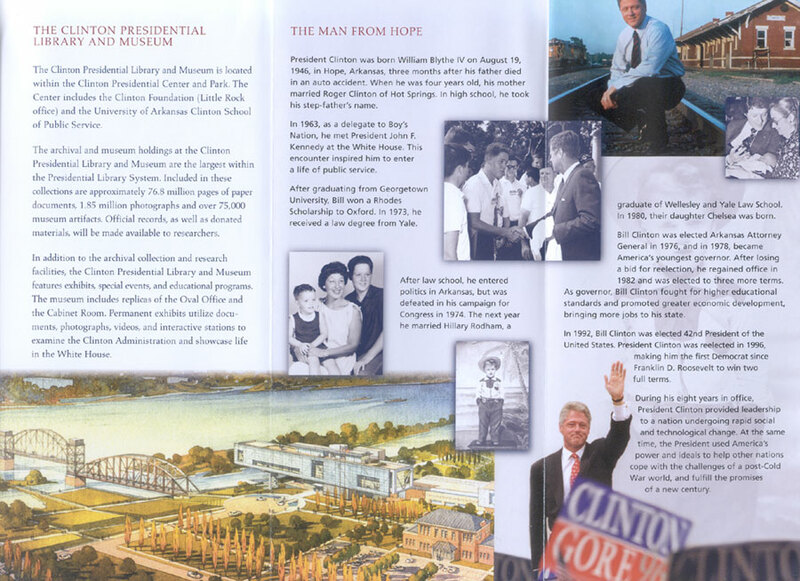 This is a brochure of the William J. Clinton Foundation depicting the artist's rendition of the proposed library on the cover. My admission ticket, even it was impressive. 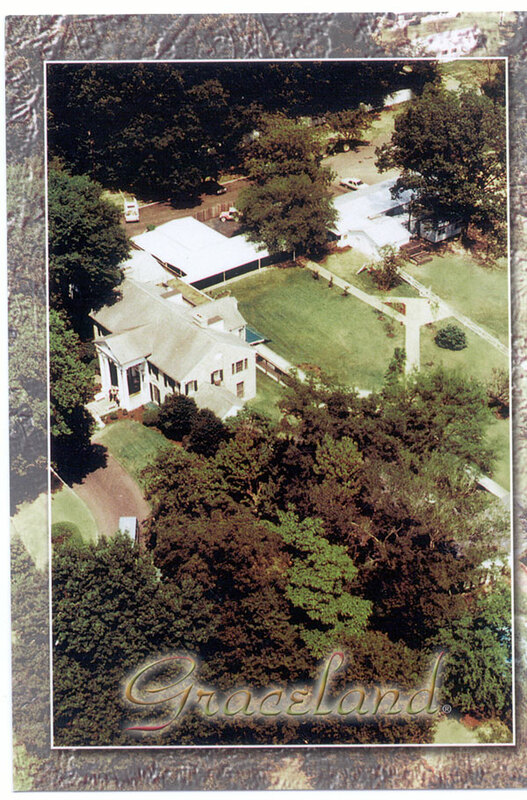 Presidential Library and Museum pamphlet. Showing the inside of the pamphlet. The tour of the presidential library and museum has given me a new goal. I want to visit every presidential library because I never realized how interesting they are and how important they are to our country's history. George in front of his house with the big one that didn't get away. 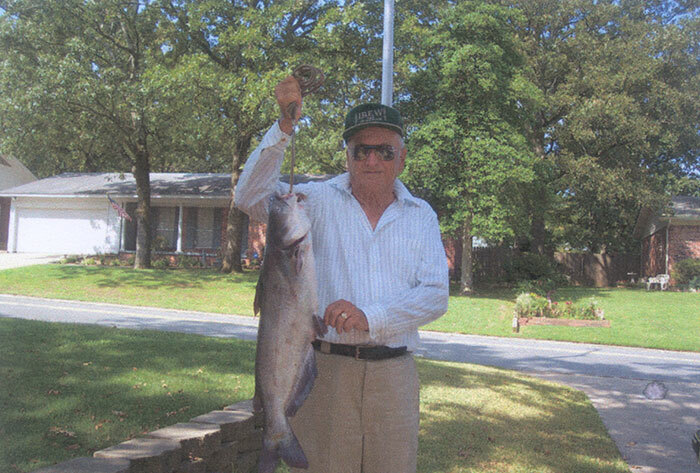 George and Connie prepared a feast for us the second night, catfish caught personally by George. No lie, it was the best catfish I've ever eaten, fresh, light, perfect batter and delicious! Connie is a great cook and we "pigged out"! Thanks Connie and George! 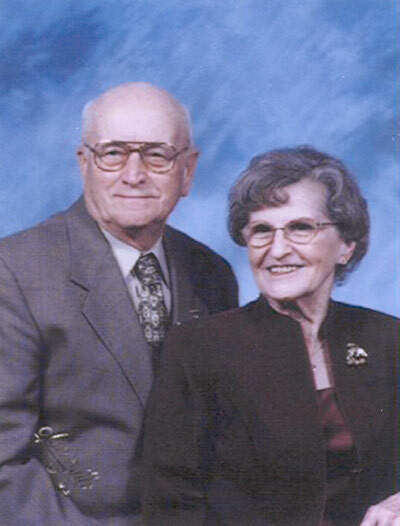 Connie and George Hatch's 60th Anniversary on March 26, 2004. Connie and George's anniversary announcement in the newspaper. If you haven't read George's autobiography, you may not know that two of their sons were killed, in separate accidents a few years apart, by drunk drivers. George was the originator of the Arkansas Chapter of MADD and he was commendated by then governor, Bill Clinton. 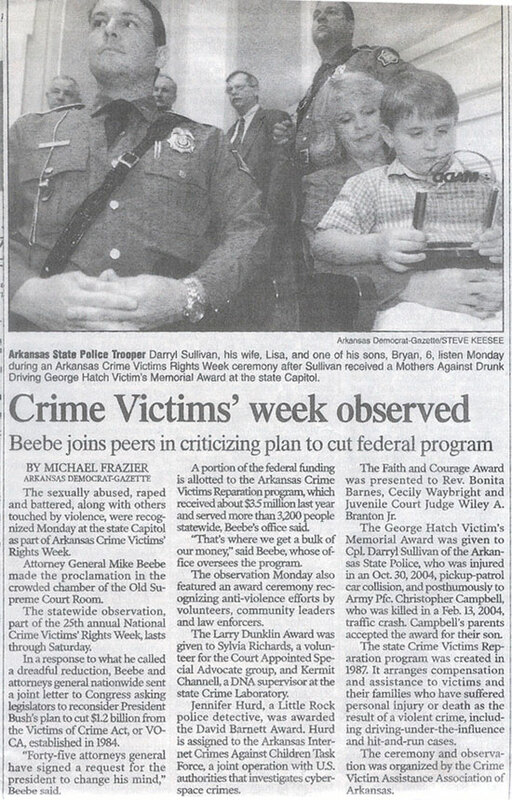 The city of Little Rock established a memorial award in honor of George and it is given out yearly during "Crime Victims Week". They named the award "The George Hatch Victim's Memorial Award". George's life is a testament to his strength of spirit and character, he's an exemplary example of Bonny Oaks, which had a small part in his upbringing. If you haven't read his autobiography, I highly recommend it. 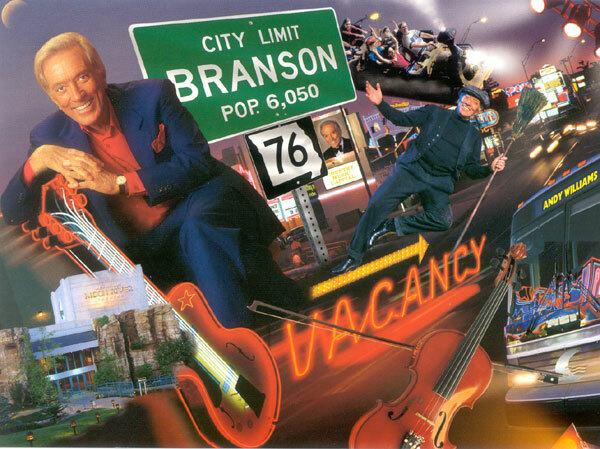 George asked me to post on the website that if any of the Bonny Oaks kids are ever in Little Rock, please call him for he and Connie would love to visit with you. George gave us a fresh supply of Bonny Oaks t-shirts and hats so we could represent Bonny Oaks at what was to be our next stop on the trip, Memphis, Tennessee, to visit Elvis' Graceland! George and Connie sent us off in style!!! Well.....this is a long story.....suffice it to say that we two Bonny Oaks girls still remembered the Bonny Oaks Girls song that we used to sing on just about every field trip. 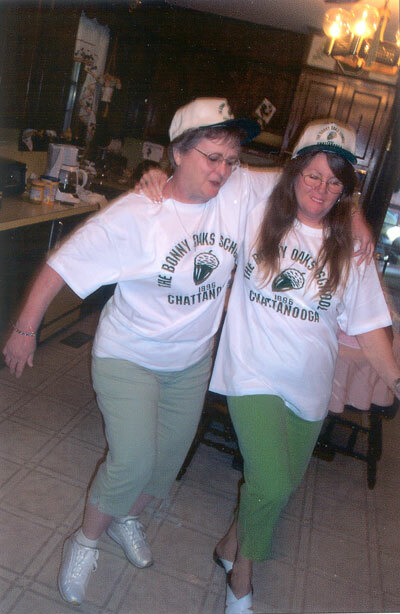 Being as we were leaving in two minutes for Memphis TN and not realizing our dance and song would come back to haunt in a picture, we did our rendition of the Bonny Oaks girls song for George and Connie, who promptly took a picture of it. This is for you, George, I wouldn't have posted it for anyone else, ha! The song goes like this, "We are the Bonny Oaks Girls, we wear our hair in curls, we wear our dungarees, above our dirty knees, we wear our shirt tails out, we love to sing and shout, we are the Bonny Oaks girls from Bonny Oaks drive." Now, much to my dismay, we also went into the second chorus which goes, "Andddddd, when those Bonny Oaks Boys come marching in, we're gonna sing and shout and sing again, we're gonna roll those boys in the mud, in the pot, rah, rah, rah, rah, rah!!!!" Okay, George, are you happy now?!!! It was a great three days! 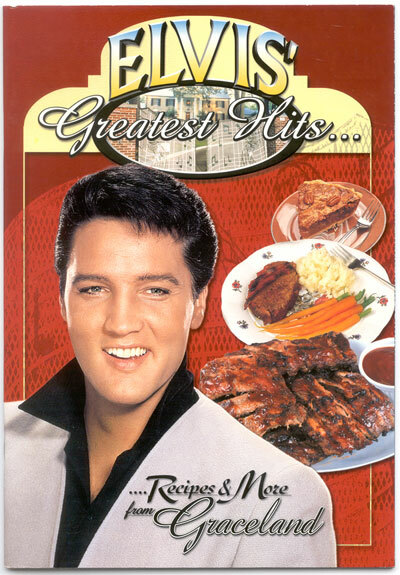 Elvis loved southern style country cooking - This cookbook contains the recipes of Elvis' favorite foods as told by his cook and how she prepared them just for him. 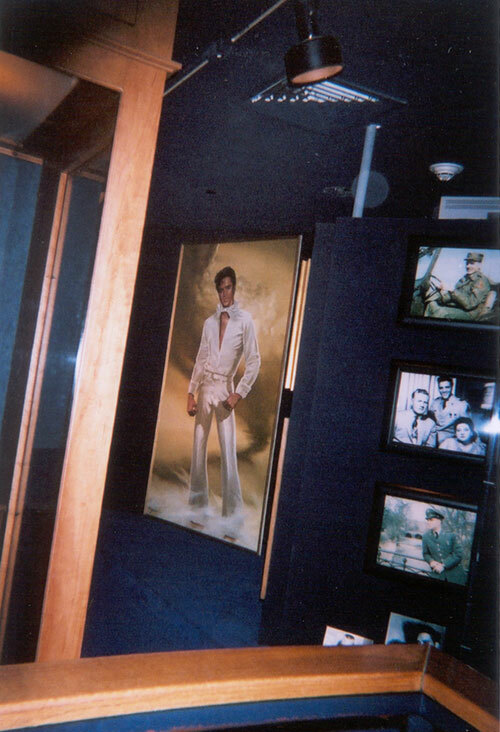 Dianne took this picture from an adjoining room so you can't tell that the picture of Elvis was almost ceiling to floor. Flash photography is not allowed, but, we won't tell Mr. Adamson Dianne cheated. 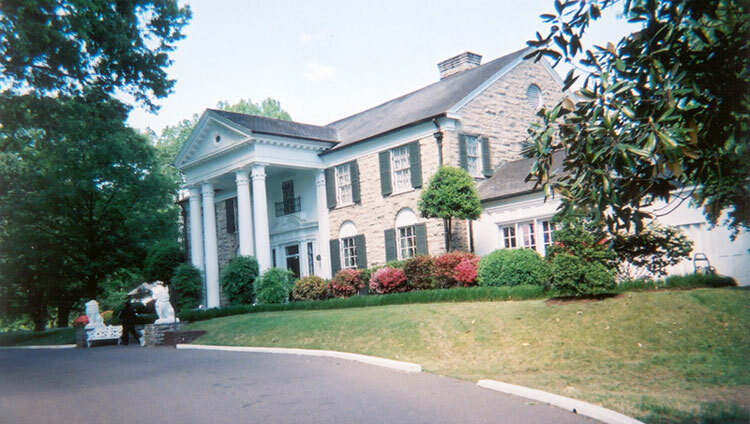 The trophy building on Elvis' property behind the home. 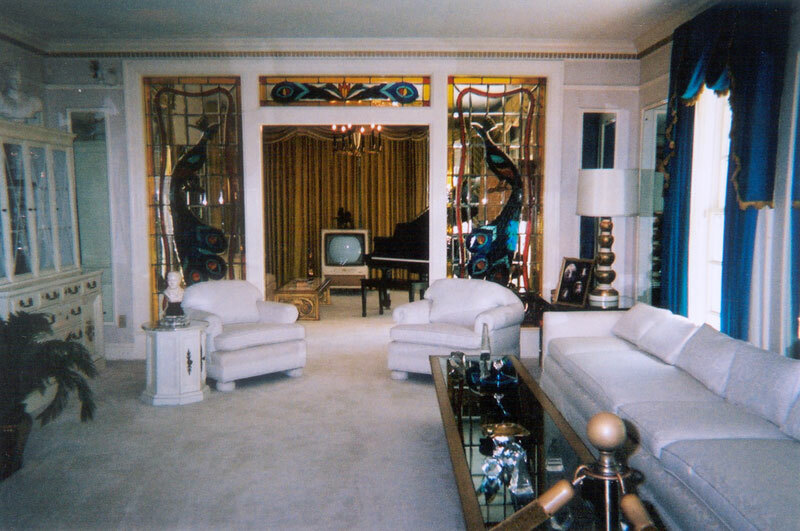 When you walk into the home, this living room is on your immediate right. It's beautiful! I wish you could see book showing pictures of the complete house and property. 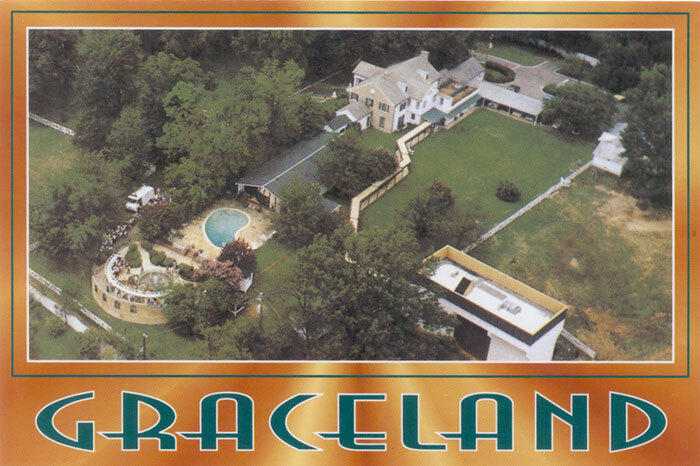 Across the street from Graceland is the Heartbreak Hotel. We had to run over there and hang out in the lobby and visit the gift shop, why? 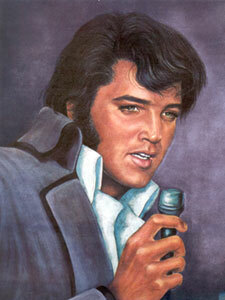 cause we just "had to", it was THE Heartbreak Hotel! 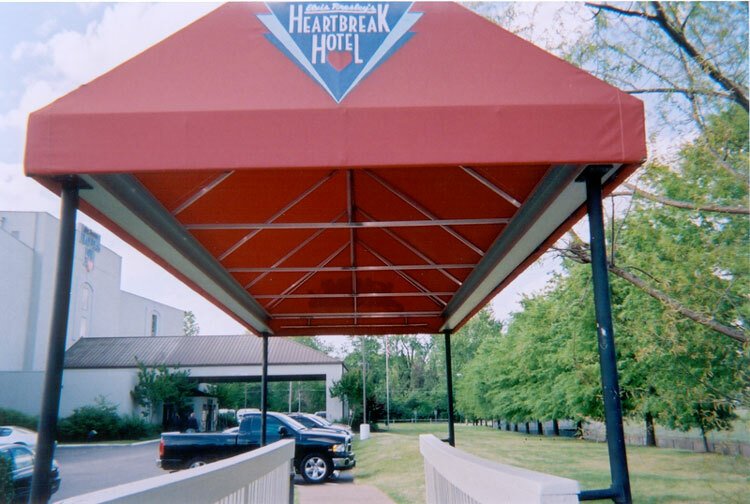 While we were at The Heartbreak Hotel, Dianne called her cousin, Paula, who came right over. 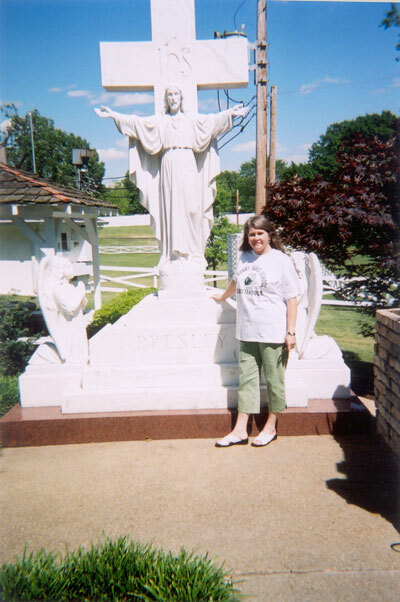 Paula and her family live in Memphis, not too far from the hotel. 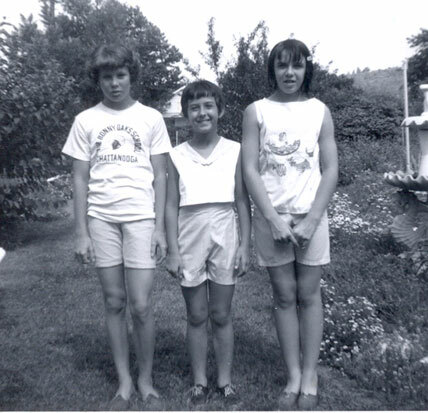 It was very rewarding to me to be able to meet the "grown" Paula (far right - her sister Lori is in the middle), after posting the childhood pictures of her with Dianne earlier on the website. 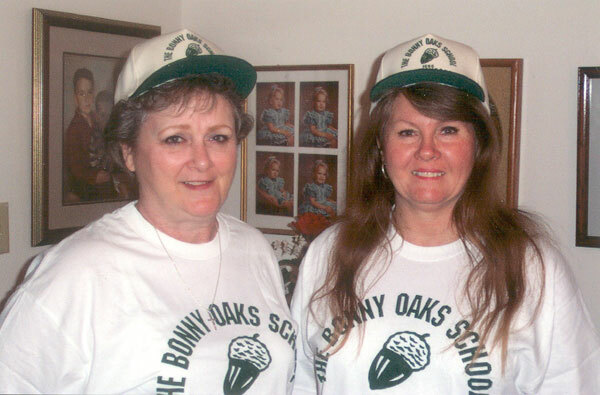 It was a nice coincidence that Dianne was wearing Bonny Oaks t-shirts in the before and now pictures. Dianne and Paula hadn't seen each other in years and there was some fast talking going on to get in all the news in such a short time. 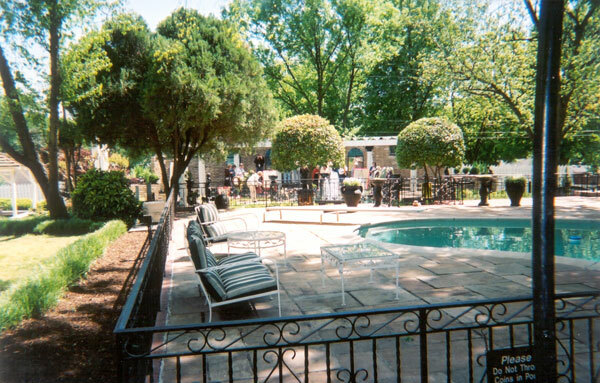 The Pool and Garden area. 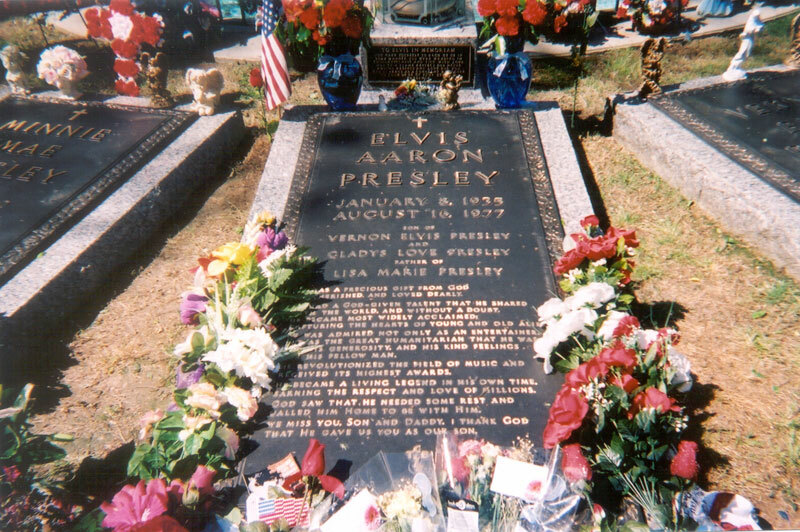 Elvis, his mother, father, and his grandmother's resting place at Graceland. 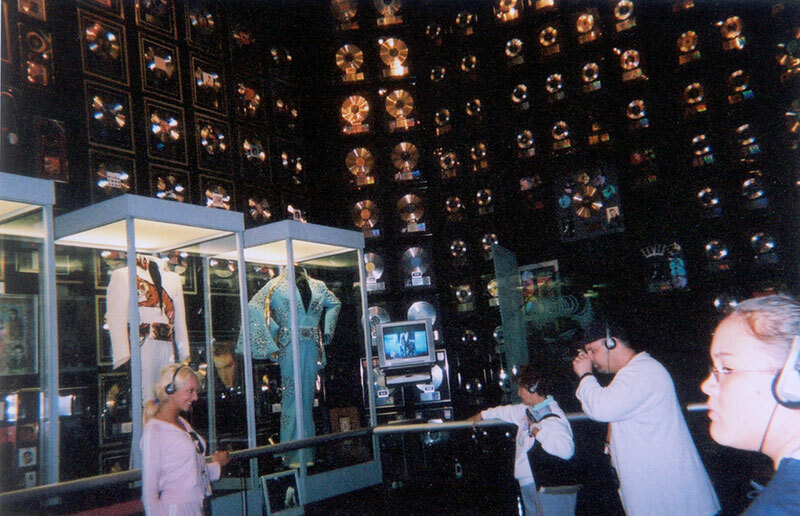 I have to tell you that the Graceland tour is very quiet and very respectful of Elvis and his family. Headphones, not employees, tell you the story of each room and people talk in quiet tones. 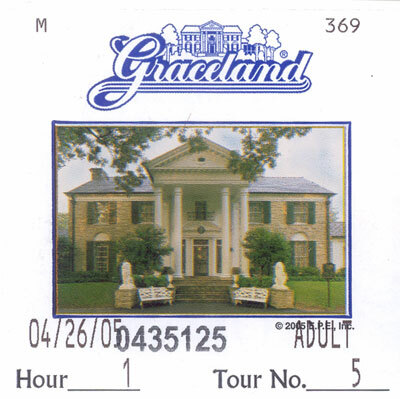 Only the grounds, buildings and downstairs of the home are available to the public. The upstairs is not open to the public out of respect for the family. 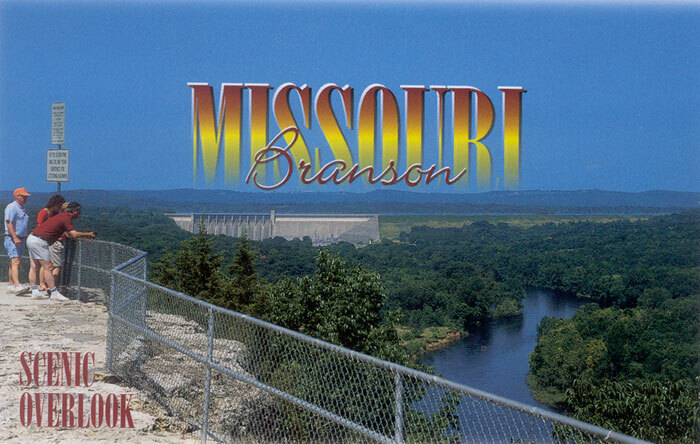 After leaving Memphis, we drove up through Arkansas on our way to Branson Missouri. We stopped for the night in a little town called Hardy, Arkansas. 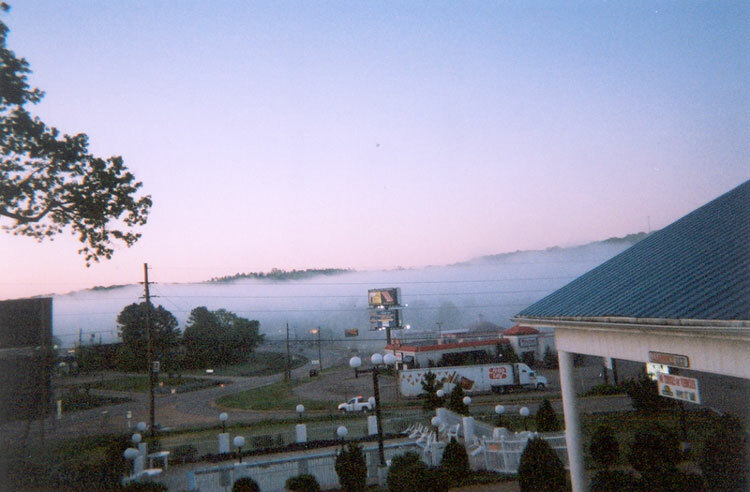 Our view from our second floor room the next morning was of a beautiful and striking fog bank over the river - We were expecting a beautiful view of the valley like the office told us there would be but the fog bank was really neat to experience too. It lifted before we left the town of Hardy Arkansas and the valley was pretty too. 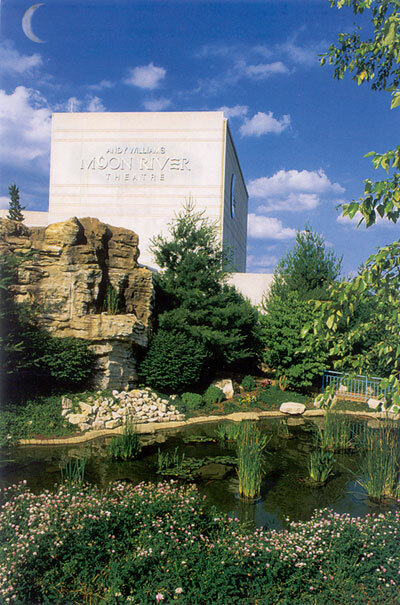 When we arrived in Branson, Missouri, Dianne spotted the Andy Williams Theatre and we ran in, just in time for the show. We met Andy's brother, Don, who sat behind us, he was extremely nice and looks just like Andy. We had excellent seats. 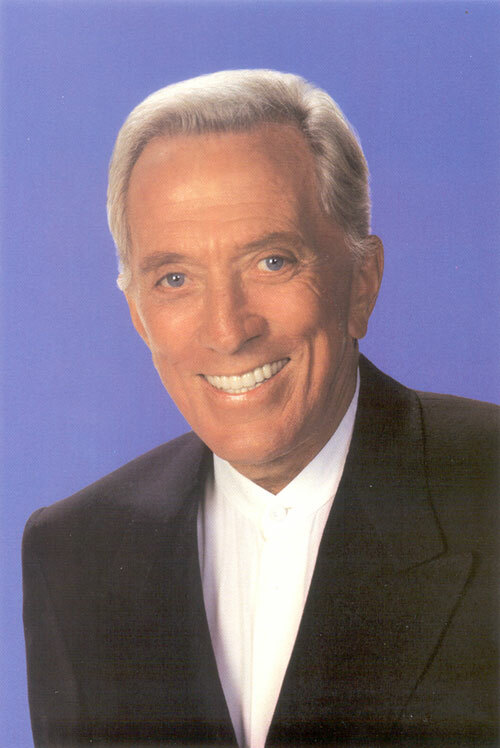 Postcard of Andy Williams picture collage. Andy's theatre and parking lot is situated on a hill, so we had quite a jaunt to get inside before the show started, we were panting. It's a beautiful theatre and very meticulously maintained. 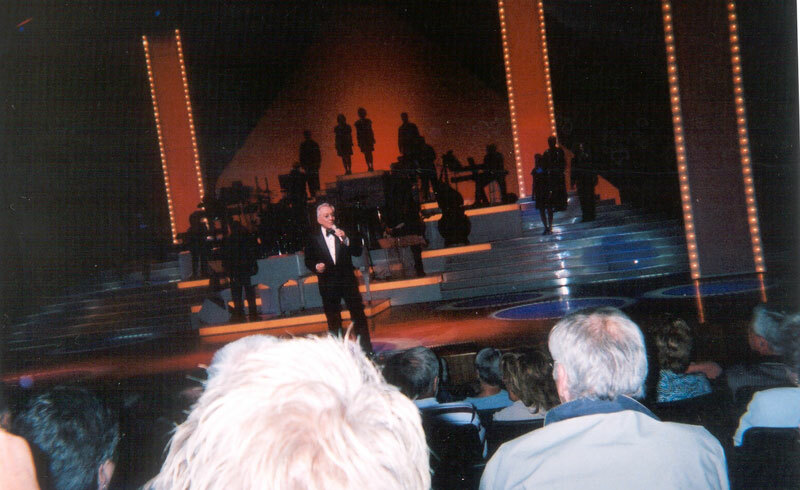 Andy on stage with backup singers and musicians. It was really a class act. He hits those high notes and holds them just like he always did. We seemed to see a lot of silver and gray hair so I felt right at home. 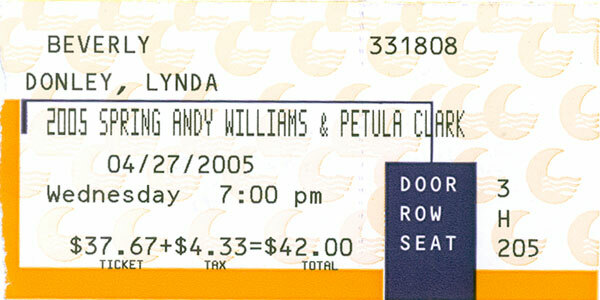 Andy Williams and Petula Clark doing a song together. They were really great! The next morning, we went to the Yakov Smirnoff Theatre. He does an early show at 9:00 a.m. It was absolutely hilarious! His show is also full of patriotism and we enjoyed it very much. 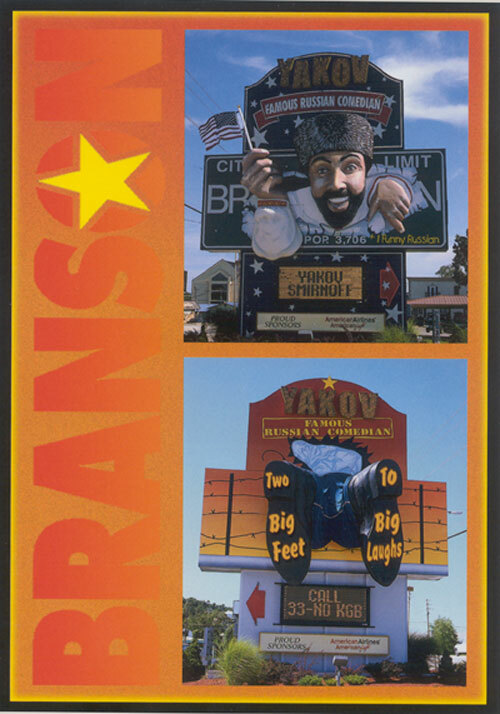 Brochure about Yakov from his gift shop in the theatre. 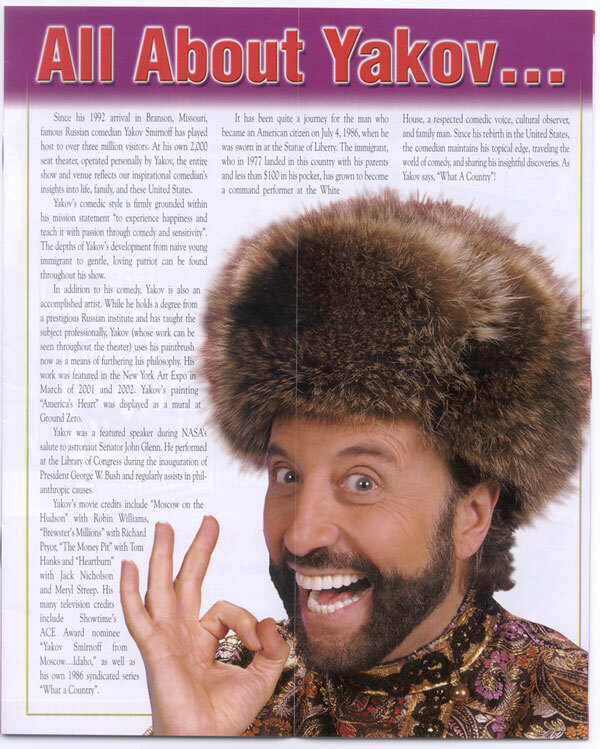 Yakov Smirnoff sign in front of his theatre. 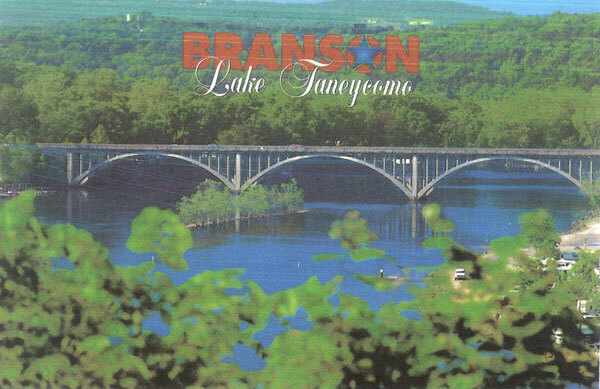 We had to leave about ten minutes early so we could catch our next adventure, dinner and a show on the Riverboat Branson Belle. 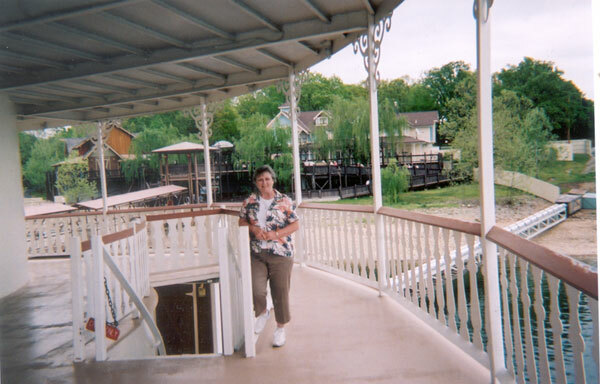 Dianne on the showboat Branson Belle after we docked. The dinner and show took up the whole boat trip so we had to hurry and get pictures of us on the boat before they closed. 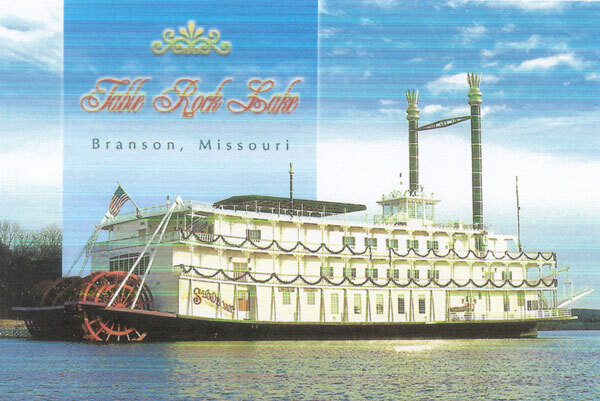 Postcard of a showboat on the Table Rock Lake. 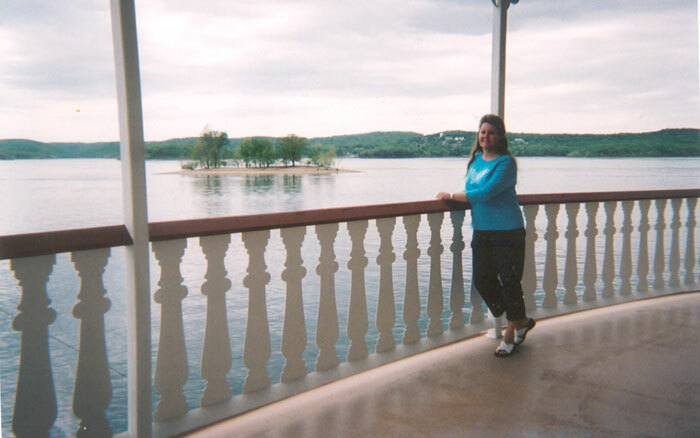 Christine on showboat Branson Belle, docked. 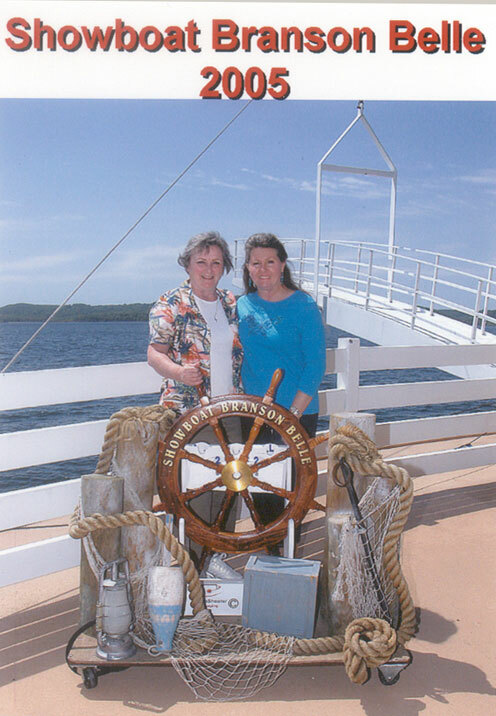 Just as we arrived on the showboat, the Branson Belle photographer took this picture. We were last on board, almost missed the boat. 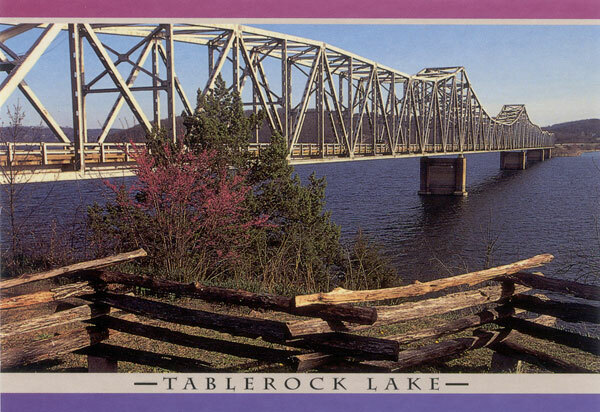 Postcard of Bridge over Tablerock Lake. One last picture on the boat, had to get the little island in the background. 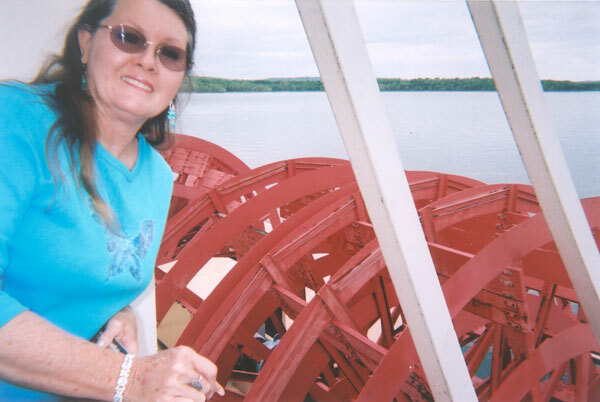 It was a beautiful day and a great picture of Dianne. Dusty Rogers (Roy's son) performs his father's songs and other western music. 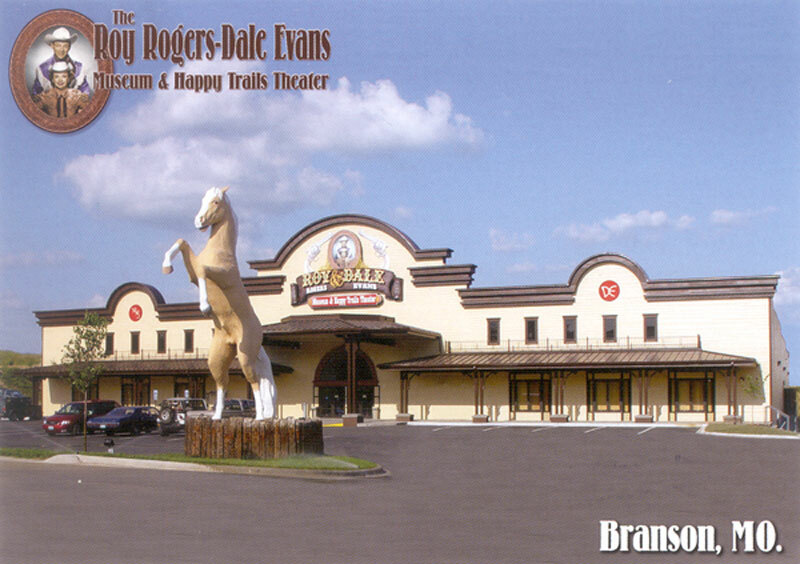 Dianne in front Postcard of the Roy Rogers - Dale Evans Museum and Happy Trails Theatre. 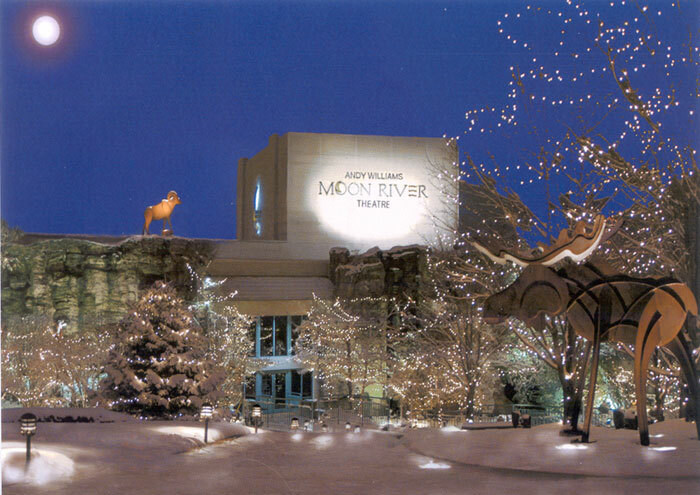 When we were getting the tickets for admission, Roy Rogers granddaughter (about 8 years old) came up to the lady at the ticket counter and asked her if she wanted some of the birthday cake they were cutting. 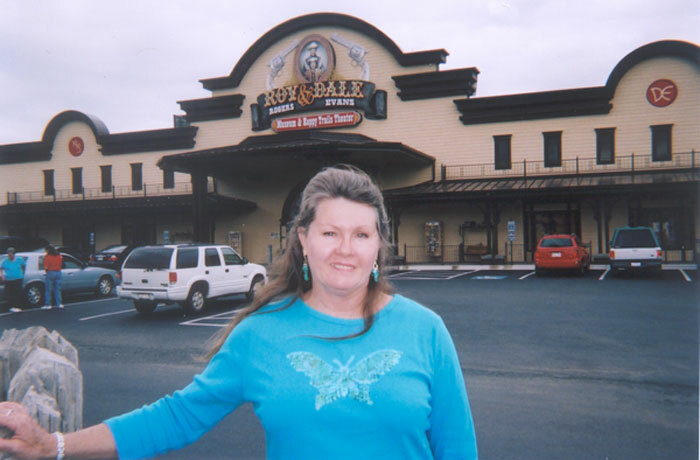 It was a thrill for us to see the granddaughter of Roy Rogers and later on the tour we also saw her mother. The museum brought back many, many childhood memories. We loved Roy Rogers! 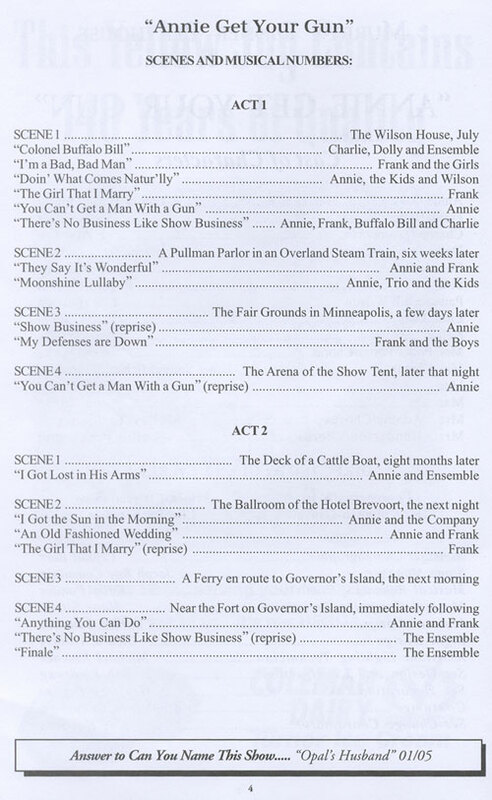 We saw Trigger, Trigger Jr., Buttermilk, and Bullet, Nellie Bell, wagons, you name it, they had it all! We watched a film on their film careers and their family life. It was very nostalgic and once again we had a great time running throughout the museum and calling each others attention to the different items. Again, we were wishing Tom Donley could be on the trip (and thanking him). 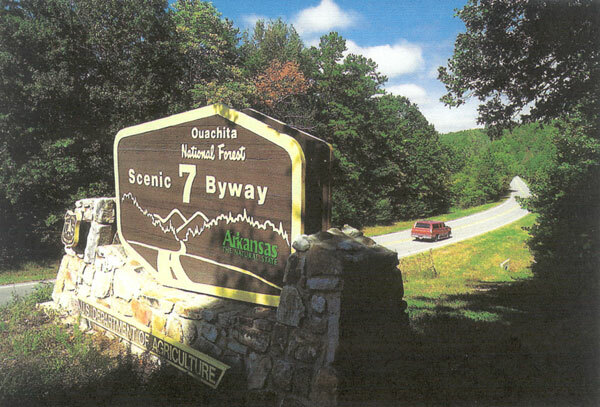 Arkansas - Scenic Byway 7 - Going through the Ozarks - Mountains, we loved them. Almost as good as Tennessee mountains! 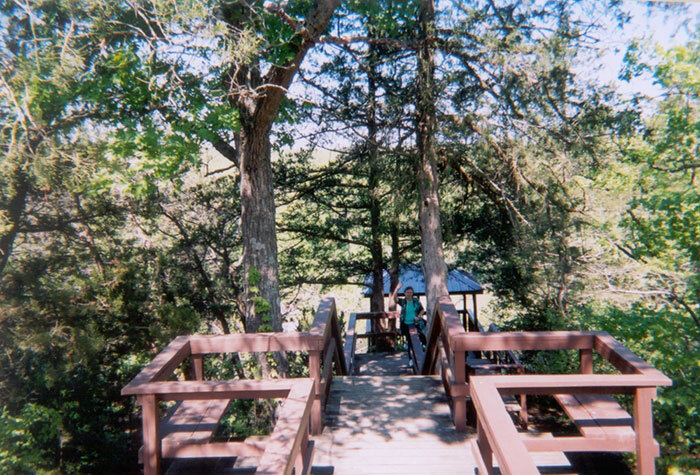 Stopping on the road to see the lookout point of the river. 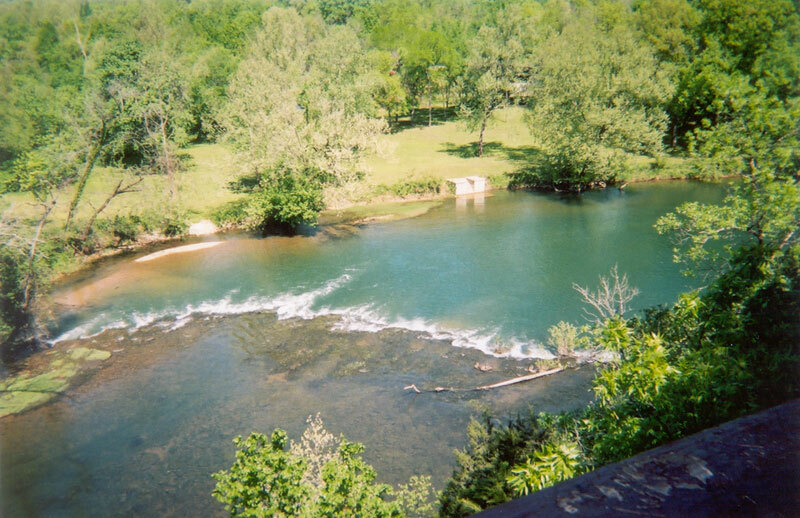 View of the river from the lookout point. 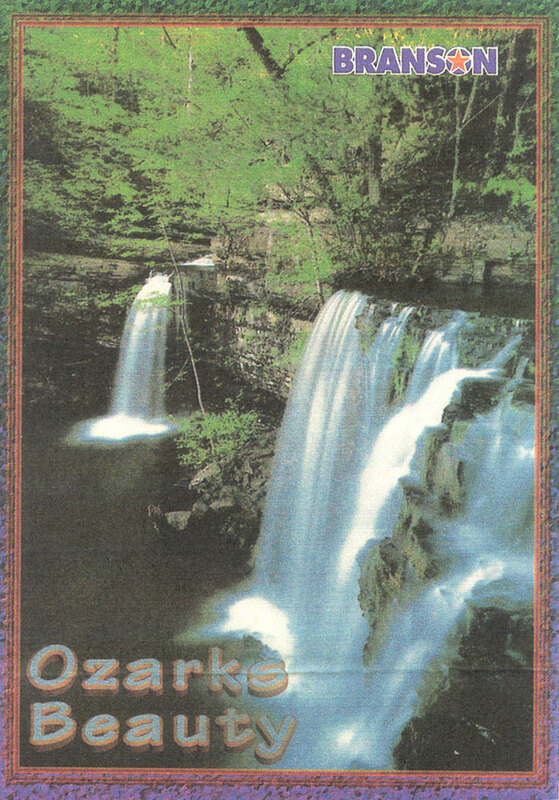 Ozarks Bed & Breakfast where we spent the night, it's name was The Cliff House. 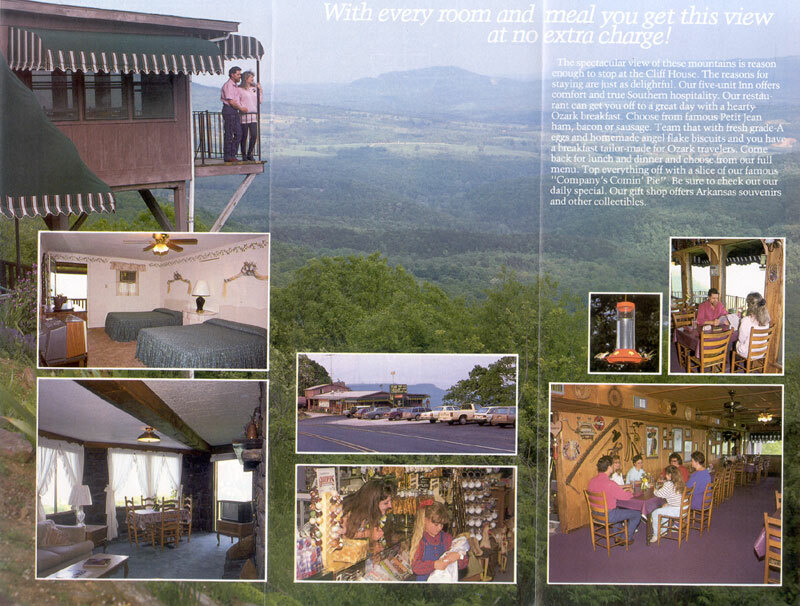 Inside The Cliff House brochure showing an overlook of the "Grand Canyon" of Arkansas. It was thunderstorming, complete with fog, the next morning and we didn't get to see the view but this brochure showed us what we missed (kinda), sure was hoping to see the view. We had a great breakfast here and then headed out to see the mountains on our way home. 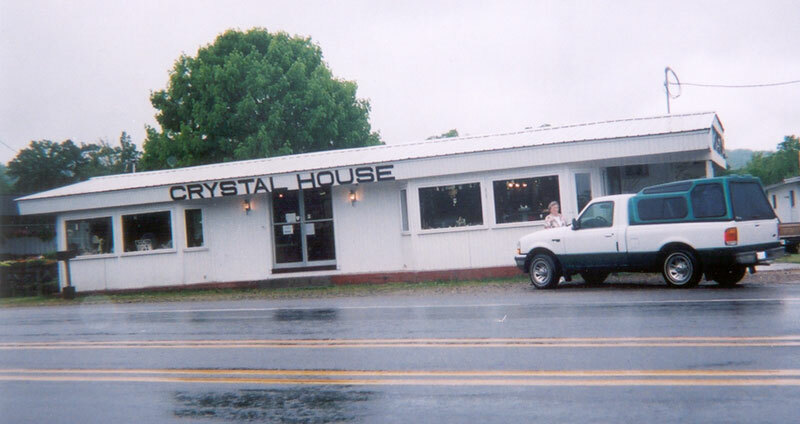 Crystal House gift shop in a small town in Arkansas. We broke out of the mountains and headed to Texarkana the last night so we could be sure we would make Dianne's plane back to California the next day. 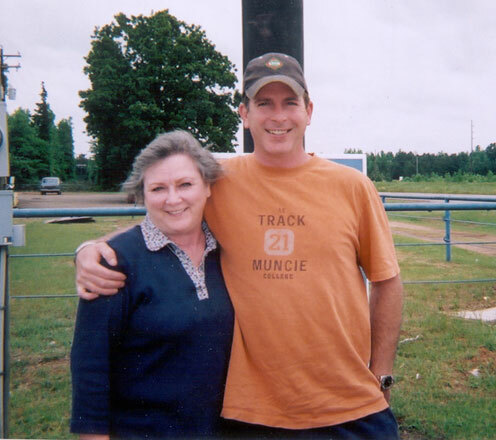 As we left Texarkana the next morning, my son James called on the cell phone and he was heading on the road toward us. He was driving the company van to Chicago for a business trip. So we coordinated a stop on the road and gave each other a big hug hello and goodbye. He and Dianne were glad to be able to see each other again. This space should have been a picture of Dianne and me at the airport but because of tough security at the Houston airport I had to take her to the drop off point and get a quick goodbye hug there. We still can't believe what an eight day whirlwind trip we went on. It was 1700 miles of friends, beautiful country, class hotels, great food, interesting tourist sights, superb entertainment, gift shops, laughs, lots of sun and lots of thunderstorms......and we talked, laughed and had fun all the way through it. Thanks Tom and Dianne, I will never forget this vacation and hope you won't either!! !